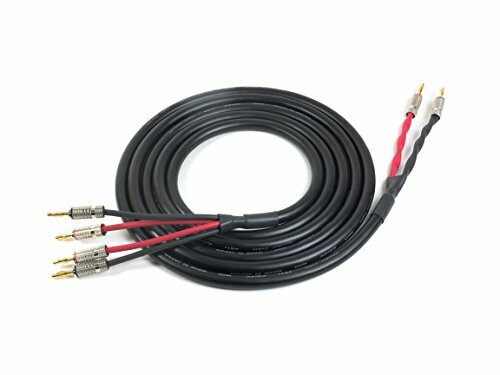 Canare 4S11 Bi-Wire Speaker Cable (2p to 4p) | Premium Bananas | 15 Feet | 15 Ft by ChromaLeaf at Right Clearing. MPN: CL-CAN4S11-BI-PB-B-15. Hurry! Limited time offer. Offer valid only while supplies last. ChromaLeaf's Premium Speaker Cable is built from Canare 4S11 Star Quad 14 Gauge Cable (Japan), and hand assembled at our facility in the USA. ChromaLeaf's Premium Speaker Cable is built from Canare 4S11 Star Quad 14 Gauge Cable (Japan), and hand assembled at our facility in the USA. Canare's special polyethylene dielectric offers low capacitance and low series resistance for improved frequency response over long distance cable runs. Each conductor is color coded with red and black heatshrink for simple identification between positive and negative terminals. ChromaLeaf takes pride in the quality and workmanship of our cable assemblies, and provides a Lifetime Warranty on our entire line of cables. Should an issue arise, our lifetime warranty covers defects in materials and workmanship to the original purchaser. If you have any questions about this product by ChromaLeaf, contact us by completing and submitting the form below. If you are looking for a specif part number, please include it with your message. SA-LB HIFI Hi End Stereo 1/8" 3.5mm Male to 2.5mm Trrs Female Balanced Cable, Headphone Audio Adapter for Astell&kern Layla, Rosie, Roxanne II, AK T8iE MKII, Angie II etc.